Francesco Group Apprenticeships are a great way for you to kick-start your career in the hairdressing industry! Are you passionate about starting your career in hairdressing but have no prior experience? With a Francesco Group Apprenticeship you don’t need any as you’ll gain all the experience you need plus much more! What do Francesco Group Apprenticeships involve? Francesco Group Apprenticeships involve a mixture of on the job training and classroom based learning which enables you to put your theory knowledge into practice on the job. Francesco Group has a large network of independent salons in locations throughout Staffordshire, Cheshire, West Midlands and Dorset. Francesco Group Apprenticeships offer a fantastic opportunity for you to join an exciting industry while starting work and earning your own money whilst also gaining a nationally recognised qualification, vital experience and highly sought skills. 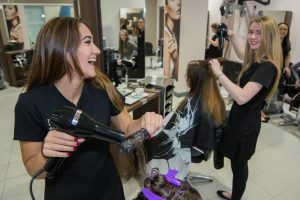 As an apprentice you’ll get paid at least the National Minimum Wage for Apprentices while being employed in a reputable salon working between 30-40 hours per week. Francesco Group Apprenticeships provide a credible alternative to A Levels or going to University. They currently offer a Hair Professional Apprenticeship which incorporates functional skills if you haven’t already achieved these in Maths, English and ICT. Are you ready to take your first step onto the career ladder and become a fully qualified hairdresser?